Preparation: Clean surface of all debris before applying. 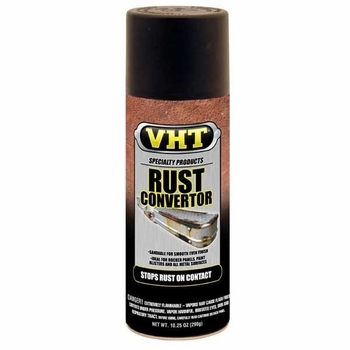 VHT Rust Convertor chemically reacts with rust and destroys it on contact. Once this rust conventor sprays on clear and when it makes contact with rust it turns it to a black metal-protecting coating to prevent future rust from forming. Designed for use over fiberglass, body filler or metal, VHT Rust Convertor sands to a smooth, even finish. Sprays on clear and turns rust to a black metal-protecting coating. Chemically reacts with rust and destroys it on contact. Use on fiberglass, body filler or metal. Sands to a smooth, even finish.